Making Precious Strides, Inc. presented a check for $20,000 for medical research related to Hunter Syndrome. 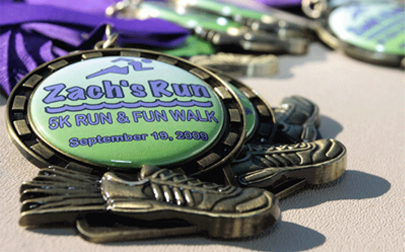 A check for $20,000 was presented at the 2009 Zach's Run for medical research initiatives. Making Precious Strides, Inc., the host organization of Zach’s Run, presented a check to the North Carolina Children’s Hospital for the third consecutive year. The hospital currently has one of the nation's leading research programs specializing in MPS-related research led by Dr. Joseph Muenzer. Research and clinical trials have lead to the introduction of Elaprase, an enzyme replacement therapy that has proven to reduce the affects in MPS II patients. More information regarding these research efforts will be posted on our parent site, http://www.makingpreciousstrides.org.